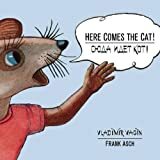 One mouse is on a mission to warn as many people as he can (in both English and Russian) that a cat is on the way! What will happen when the cat arrives? Surprising and fun, highly recommended by staffer Simone. Jenn has been obsessed with this book since it came out in hardcover -- and now it's in paperback! It's the perfect mix of hard-boiled Western (a la Lonesome Dove) and fantasy (a la Ursula Le Guin, who also blurbed it! ), and ideal for taking a mental vacation during your summer vacation. With stories by 18 talented women including staff favorites Kate Bernheimer, Lydia Davis, Karen Russell, and Kelly Link, we can't not recommend this book to you. The first book on one of the graphic novel genre's most influential creators to actually have his cooperation, Storyteller is stunning to behold and fascinating to read. Full-color pages of illustrations and photos accompany explorations of his life, and there's an audio CD of his performances as well. Well worth the $45 for the die-hard fan!